Oscar has become the 15th named storm of the season. Tropical Depression 15 formed Wednesday on October 3, 2012 in the eastern Atlantic Ocean, west of the Cape Verde Islands and was upgraded to Tropical Storm Oscar by evening same day. The system is likely to turn toward the north and then the northeast with a small chance to come close to Azores next week. This system is no threat to land. 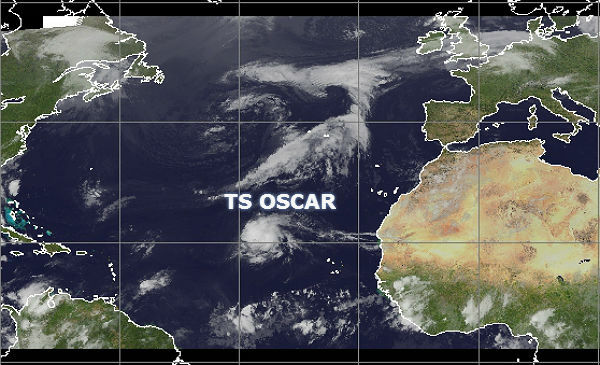 Oscar is a large tropical cyclone. According to latest public advisory by National Hurricane Center, the center of Tropical Storm Oscar is located near latitude 22.0 north and longitude 40.2 west. Oscar is moving toward the northeast near 12 mph (19 km/h) and the storm is expected to accelerate toward the northeast on Friday. Maximum sustained winds have increased to near 50 mph (85 km/h) with higher gusts. Little change in strength is forecast before Oscar dissipates in about 24 hours. Tropical-storm-force winds extend outward up to 205 miles (335 km), mainly east of the center. The estimated minimum central pressure is 998 mB. 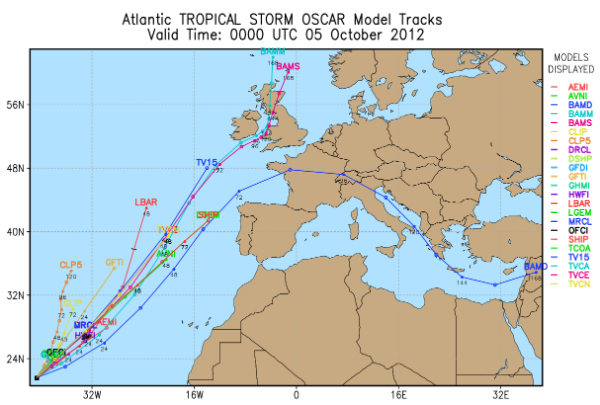 Despite Oscar moving faster over warm waters, little change in strength is anticipated due to moderate or strong shear. Atlantic Ocean gyre is expected to turn this tropical cyclone toward the north, then northeast over the next few days. With increasing wind shear, this system may be absorbed by the large non-tropical low pressure system by late Friday. A cold front associated with the mid-latitude system should absorb Oscar in about a day. A large non-tropical storm that will influence the tropics is getting stronger in the North Atlantic. Non-tropical storm moving over the Atlantic that picked up and brought Nadine's reign to an end is forecast to scoop up Oscar. Theis cold front system could eventually extend impact in the form of gusty winds and areas of heavy rain to the United Kingdom and part of Europe, before diminishing during next week.